Okay, it’s not actually for cars, but what a great idea! 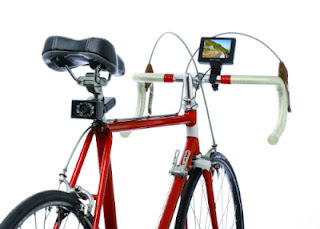 The bicycle rearview camera, available through Hammacher Schlemmer, gives cyclists a view of what’s behind them without turning their head. It has a 3 1/2 inch colour monitor that sits on the handlebars, giving a 75 degree field of view of what’s behind. The camera itself is on the back of the seat post. Both camera and monitor are attached with a zip-tied cable so can be taken with you if you have to leave your bike somewhere. I haven’t seen the product in person so I can’t vouch for its quality or ease of use, but Hammacher Schlemmer says it’s designed to be weather and vibration resistant. It comes with a rechargeable battery to provide 10 hours of use. Another nice feature is that the camera produces a flashing pattern of red LEDs under low light condition, making you more visible to motorists. At $179.95, it doesn’t come cheap, but if you do much riding in traffic, the added safety is probably worth it.